The new Hyundai Santa Fe gets a big hike in quality – and price. But is it worth the extra? Verdict4...The Santa Fe is a big step up from the model it replaces. It looks like a car from the class above, and it’s comfortable and well equipped on the inside, too. It drives relatively well, and will transport up to seven people with very little fuss, providing you dodge the potholes. Is it good enough to justify the extra £3,435? We’d say so, but only just..Hyundai claims its new Santa Fe is such an improvement over the car it replaces that it nearly got a new name. 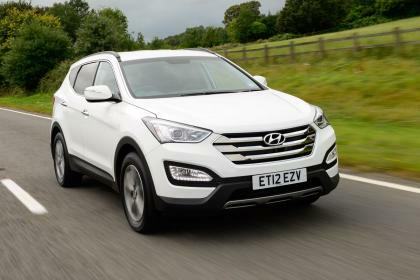 It certainly needs to be much better – the mid-spec Premium Auto model driven here costs £3,435 more than the equivalent version of the old Santa Fe. That’s a serious amount of cash. But even before you’ve turned a wheel, the new car’s looks start to claw back some of that extra outlay. Gone is the dull two-box shape, and in its place is a sleek, modern and distinctive design. There are a couple of concessions to its rugged off-roader past, such as the front and rear skidplates and the honeycomb mesh that runs around the foglights. But the big hexagonal grille, swept-back headlights and pointy rear spoiler confirm the new Santa Fe has been styled to be used on road. The design revolution continues from the high-set driver’s seat. The dash is angular, like those on the latest generation of Fords, and features blue lighting. There are loads of switches and buttons across the doors, steering wheel and dash, and while quality is no match for a VW Group product, everything feels solidly built. Driver and front seat passengers get more space than before, with plenty of seat and steering wheel adjustment. Storage options include massive door bins for big bottles, a pair of cup-holders and a large cubby between the seats. Head and legroom is good in the second row, with passengers getting a pair of cup-holders that spring from the central armrest, 12V sockets and individual heater vents. These seats fold forward and lie almost flat with the single pull of a boot-mounted lever. Our car also had the optional third row of seats, which flip up from the boot floor. They’re tight to get into, and space is limited, but they’re OK for children. The small window does make the rear feel dark and claustrophobic, though. As with all seven-seaters, the boot is eaten up by the extra seats when they’re up, but storage space is an impressive 2,247 litres when stowed. 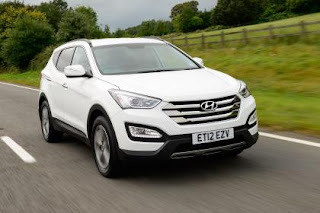 At launch, the Santa Fe is only available with Hyundai’s 194bhp 2.2-litre diesel. It’s not the quietest engine, and isn’t at its best when mated to the ponderous six-speed automatic gearbox, but it quietens down on the move. The steering is dull and lifeless, yet you’re always in complete control. And although our car had four-wheel drive, unless the going gets slippy or you press the diff lock button on the dash, the front wheels are driven most of the time. Hyundai has added firmer dampers to cope with the UK’s potholed roads. At speed, you’d never notice, as the Santa Fe floats along, with a compliant ride. But if you do hit a pothole, the car bangs and crashes, which is the only blip in an otherwise polished driving experience. .Disqus - noscriptSubmitted by Soren Lorenson on Thu, 2012-09-20 09:39. £31K for a Hyundai? I know they are pretty good cars but they are up against some pretty serious competition at this level. Perhaps they have forgotten their USP - value. Don't they realise that the companies competing at this price point are all struggling to make money (VW excepted). Submitted by JWB on Thu, 2012-09-20 14:06. Regarding the steering, this new model is fitted with the new Hyundai FlexSteer system that gives the driver the ability to select from three settings. I wonder if this is why you felt the steering was "dull and lifeless" ??? Submitted by JWB on Thu, 2012-09-20 14:08. Still great value... More expensive but a whole lot more car!